It: Chapter Two Adds James McAvoy, Bill Hader | Nerd Much? 2017’s It performed incredibly well both critically and financially. There’s little doubt that there’s quite a bit of hype behind its sequel, It: Chapter Two. And to make sure the film hits the high bar its predecessor set for it, the production team is bringing in some big name talent. 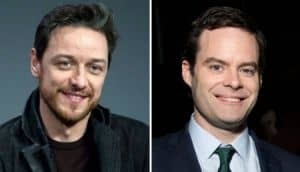 Reports are indicating that New Line Cinema is in negotiations with both James McAvoy and Bill Hader for roles in It: Chapter Two. McAvoy would be playing the adult version of Bill Denbrough. While Hader would be taking on the role of Richie Tozier. Jessica Chastain was announced to be playing the grown-up Bev Rogan in the sequel. The adult roles of Ben Hanscom, Mike Hanlon and Stan Uris have yet to be cast as far as we know. The spectacular Bill Skarsgård will reprise his role as Pennywise the Clown. Pennywise reappears within Derry, Maine every 27 to 30 years in the story’s world. With It taking place in 1989, It: Chapter Two will occur in 2016. The Loser’s Club have grown up and moved away from their hometown. But the plot description states that “a devastating phone call brings them back to Derry, Maine to their final confrontation with its ancient enemy: Pennywise the Dancing Clown. Andy Muschietti, director of It, is back in the chair for It: Chapter Two. He’s working off of a script penned by Gary Dauberman and Jeffrey Jurgensen. Muschietti stated on his Instagram account last week that the sequel would begin production sometime soon. McAvoy and Hader’s additions seem to indicate things are indeed progressing accordingly. It: Chapter Two is being produced by New Line Cinema, Lin Pictures, Vertigo Entertainment and KatzSmith Productions. Warner Bros. Pictures are handling distribution. The sequel and finale chapter to Stephen King’s 1986 novel is scheduled to hit theaters on September 6th, 2019.